Aubrey has poor impulse control, so she decided that improv was the best way to take advantage of it! 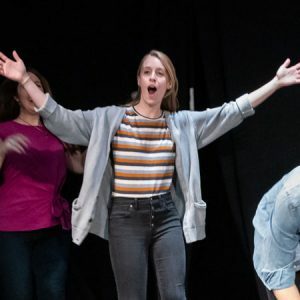 She completed her formal training at the Washington Improv Theater in early 2019, though she continues her informal training each weekday evening while making up characters and songs with her roommates. Aubrey is great at listening to details and sprinkling them back in a later scene, and it’s almost guaranteed that she will break at least once a show. Sorry, laughing is fun! Aubrey’s 9-5 is at an international development firm where she focuses on governance issues in Asia, though she’d rather not talk shop outside the office. Unless it’s about Vietnam. In her spare time, she likes reading murder mysteries and causing murder mysteries (just kidding, DCPD! ).